The leather vest are highly popular among the bikers, they call them cuts and also been the fashion of cowboys in the west of America. It now becomes a trendy style, and people are carrying it with different attires. What is a mens leather blazer jacket? 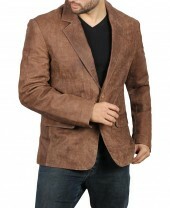 It is a just type of jacket that looks more formal and made from leather. How many pockets are featured in leather blazer men? Normally one pocket on the chest and two waist pockets. Can you wear a blazer jacket casually? Yes, you can wear it with casual clothes. How to wear a mens leather blazer jacket to look more formal? You can wear it on the formal shirt and dress pant to get the proper formal look. Best colors for blazer jackets womens? Is womens blazer jacket good for party wear? Yes, many celebrities wear blazer jacket to parties. Why mens black leather blazer used mostly? Black color easily suit with any apparel and also trendy. Can I wear blue jeans with a mens blazer jacket? Everyone has its own style and you can make yours too, so no problem in wearing a blazer on jeans. Is lambskin used to make men's brown leather blazer? Is there any sale available on collection of blazer jacket ladies? Currently, we are giving up to 64% OFF and you can avail additional discount via coupon code.